The usually excellent actor Oscar Issac opens "The Promise" with a perfectly awful accent, desperately trying to sound like an Armenian speaking English. Things go downhill fast. Issac plays a small town Armenian apothecary, who longs to study medicine. Accepting a dowry to marry a woman he hardly knows, he leaves for Constantinople and the home of a wealthy uncle. The plot thickens, when he meets Charlotte Le Bon who plays the tutor/nanny to the children of the house. He falls in love, even though he has made his promise to the girl back home. Le Bon already has a boyfriend (played by Christian Bale) who works as an Associated Press reporter and does a lot of speechifying and witnessing of the tragedies of World War I. The year is 1914 and when war breaks out, Turkey joins the Germans, while simultaneously embarking on a program to wipe out Armenians in Turkey. "The Promise" might have been improved with some explanation of the Turk's attitude toward the Armenians. Instead, we cut to executions, oppression, and a love triangle between Issac, Bale and Le Bon, not to mention the problem of the wife back home. 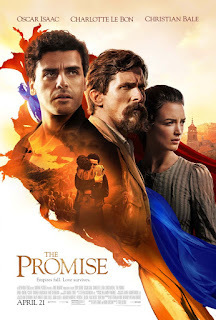 "The Promise" has many heart-wrenching scenes, and hopes to make a new generation award of the Armenian plight in Turkey. The movie suffers from a poor script with bad dialog, artificial-looking locations, even bad make-up. The effect borders on parody. The Armenians deserved better. One star, rated PG-13. Does it deliver what it promises? Clunky would-be epic. Is it entertaining? Long and hard to take seriously. Is it worth the price of admission? No.